A formal staple that has been the business uniform of choice for the past century, the suit has since found its way into all walks of life. Whether you wear a pin stripe power suit on the trading floor, a tweed number for the country or an everyday suit for business, the plethora of choices can make it a challenge to decide what to wear. Tailoring has become more appealing for the casual aesthetic with some suits now available in jersey or at least more relaxed fabrics in unconstructed offerings. You can now wear a suit for work, for play, and for going out. 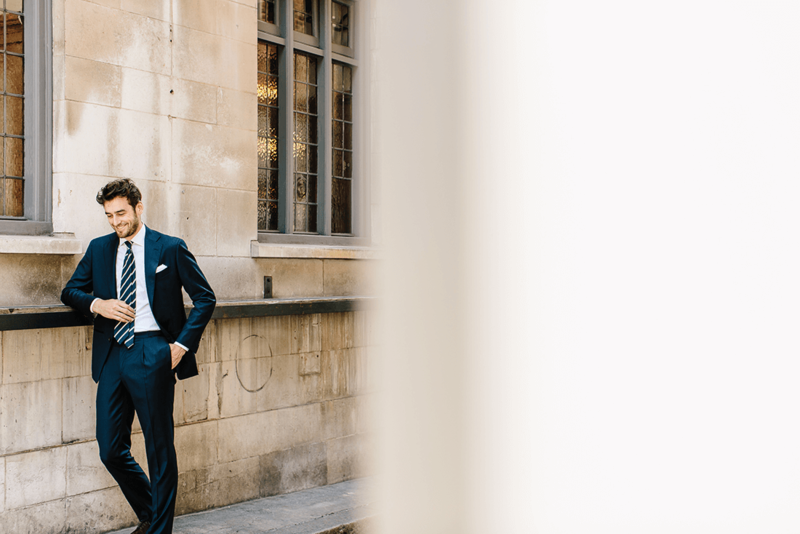 We aim to give you some insight into helping your choice of suit selection, how to wear it and how to take care of it. 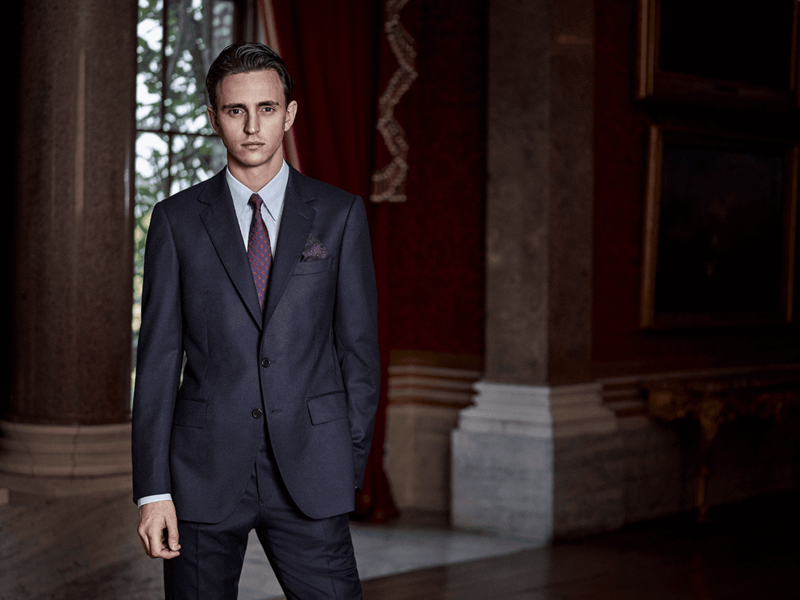 In this edition of The Rail you’ll find suiting options from premium brands; Gieves & Hawkes, Hardy Amies, Corneliani. 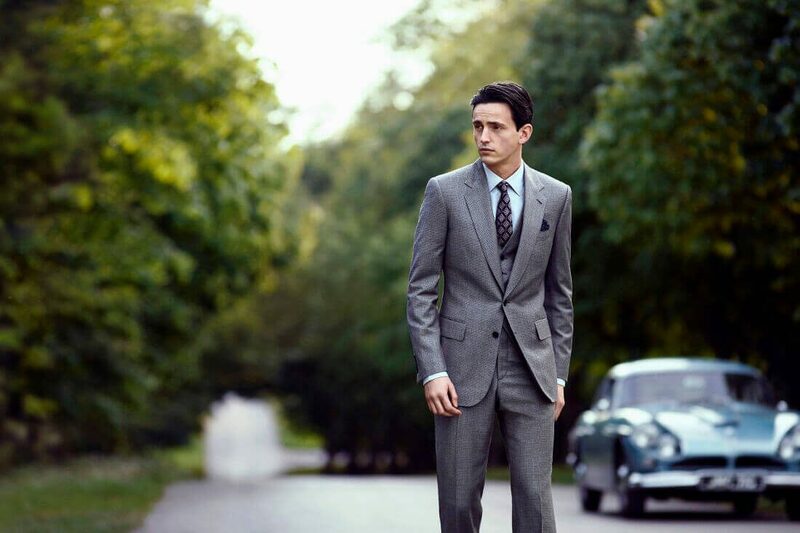 Thom Sweeney and P Johnson Tailors alongside the more affordable brands- English Cut and Suitsupply. We often hear that some men want ‘fitted’ suits that are slim and flattering. Unfortunately, it’s easy to fall into the trap of buying a fitted suit but ending up something tight and ill-fitting, that isn’t complimentary. Fitted does not mean that it should be tight on the calves, thighs, seat, chest and shoulder areas. A tailor will tell you that it should be flattering to your body type and the fit should reflect that. Nowadays it’s common to find shorter jackets that sit either above or in the midsection of the seat. This results in the trouser looking longer and therefore the body looking out of proportion. If tall, keep proportion in mind at all times- a double vented back keeps a straight back and sits over the waist nicely. Wear a suit jacket where, with your arms down by yours sides, the tail-edge ends, with your arms down by your sides, meet your fingers curled. This allows for a perfectly balanced looking suit. From there, you can play around with the break on your trouser and whether you wish to have turn-ups or a clean finish. The jacket should fit comfortably on the shoulders without too much overhang, or on the opposite side of the spectrum, not show your arms bulging and pulling the fabric. Shorter jackets tend to lend towards a more casual look, while slim lapels can help thin you out. A wider lapel offers better balance or a broader look for the thinner man, but too wide can drown you in your suit, while a peak lapel gives slightly more flair than a notch lapel is unable to give. My vote is for a happy medium- nothing too slim, nothing too wide- just medium. Whatever lapel you choose though, ensure it is a respectable width and a balanced distance from your shoulder- this will help achieve a well proportioned jacket that slowly sculpts to your chest through wear. A lot of ready-to-wear brands offer a decent selections of suits- however, be aware that they might not be right for your body shape. If you’re on a budget, keep an eye out for certain aspects of the suit that can be altered; such as unfinished hems on the trouser so you can get the finishing you want. Aim to either have a half break or clean break above the ankle. Why not try a turn-up cuff- 1.5” for shorter legged men or 2” for taller men- this will provide more shape and focus to the trouser. One thing to be aware of with RTW jackets, reflecting in the pricing, is the use of fused or canvased jackets. Fused jackets tend to be stiffer on the body and don’t allow for much give or wear to your body’s contours. This is a preferred form of manufacturing by some brands as it is cheaper to produce. The results can still be effective, but it’s something worth knowing when comparing suits. A canvassed jacket, achieved with layering sheets of canvas under the top layer allows for a softer drape and more comfortable wear. 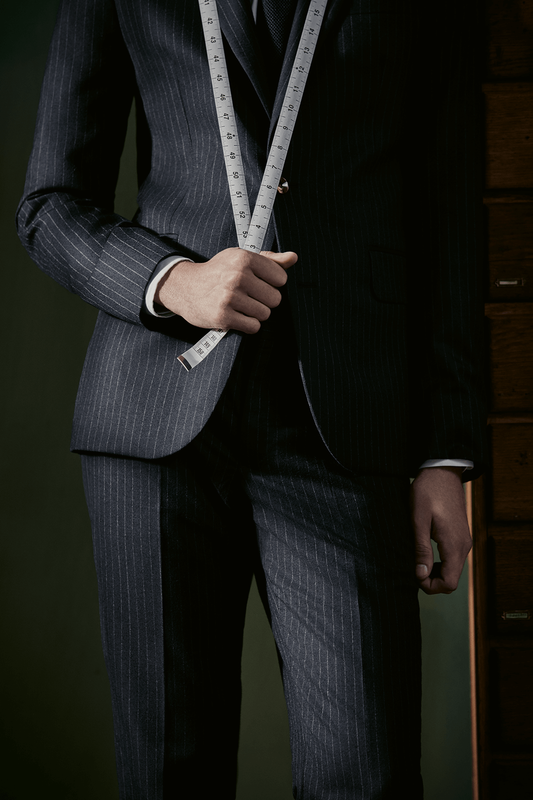 When it comes to Made-to-Measure, various brands now work around a block of their house style to customise accordingly. This will give more accuracy to the fit of the jacket and trousers. You will then be able to choose from a varied selection of cloths and speak to the brand’s tailors regarding your wishes of finishes such as your pocket preference and interior lining. The perfect fit for your body and in any style you wish, normally in your tailoring house of choices’ own unique way. You can’t go wrong with a bespoke suit. A worthwhile investment and an experience every man should have in his lifetime. Be prepared for a bill of around £2,000+ however. I recommend THOM SWEENEY or ENGLISH CUT. There are many options when it comes to the traditional shirt and tie combo- my favourite shirt brand; Eton, offer a great selection of shirts, which should be matched with a Drake’s tie, who have an option for all occasions. Button down shirts give the best look whether you’re wearing a tie or not, and cut-away collars tuck themselves nicely under the lapel. Why not change things up by wearing with a polo shirt, giving the best of both worlds in terms of smart and casual. You can pair with a dark merino wool option for a sharp finish. For cooler days, why not pair with a roll-neck or even pair a v-neck jumper with your classic shirt and tie. One trick to keep your suit in good shape, without the need of taking it to the dry cleaner, is to simply hang it in your bathroom while you take a shower or bath and let the steam loosen up threads and freshen up the suit. Another option is of course to rotate your suits to ease on constant wearing. It’s also advisable to get a second pair of trousers to help with continual wearing of the seat and stitching in the crotch area. 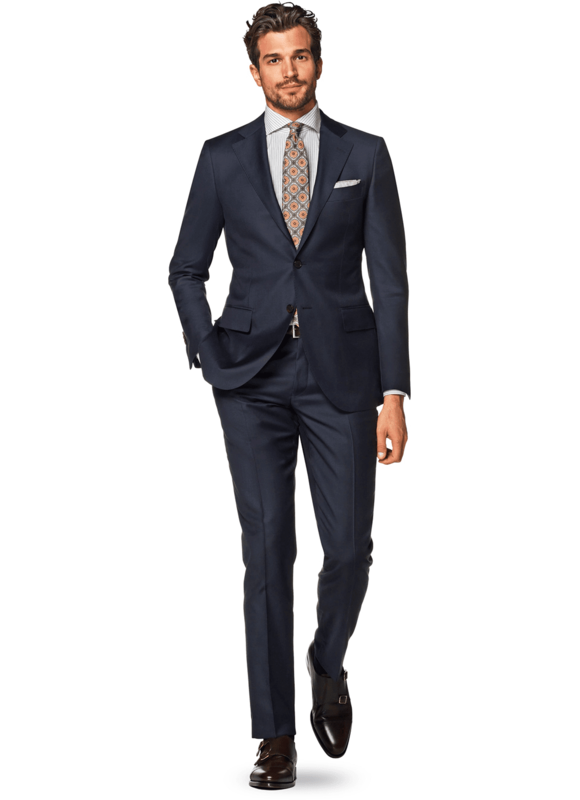 Note that a well fitting suit won’t wear down as quickly as tighter fitting trousers. Ensure your suits are protected from moths with natural preventatives such as dried lavender satchels placed inside your wardrobe. This is a worthy precaution compared to the alternative- discovering your beloved suit is peppered with moth-holes.